1395 x 1395 pixel album cover included with any song purchase. 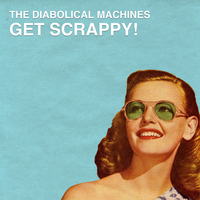 The second EP from '60s-influenced garage-y power pop band The Diabolical Machines. "Get Scrappy!" is our second major release, and it goes to much crazier sonic places than the first. Full of fuzz pedals, overdriven Farfisa organs, and songs about relationships, underdogs, introverts, and 1920s tattooed ladies, it's a garage rock-inspired warping of our usual catchy hooks. The end result, we think, defies easy categorization. It's our own take on our influences - power pop, indie rock, garage rock, riot grrrl, art punk, lit rock. It's what happens when you give English majors a distortion pedal. And it's something we're very, very proud of.